The Oak Center General Store is the home-base of Earthen Path Organic Farm, a 14-acre fruit, herb and vegetable farm. 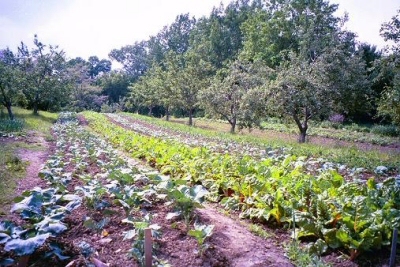 We frequently accept interns and apprentices to organic vegetable growing and marketing. In exchange for room and board, and a monthly stipend, we will teach greenhousing, planting and cultivation, harvest, and marketing for those who are interested in learning and working with us. In the mix of things, they will learn food preservation, and many other homestead skills. We ask that only motivated, work ethic minded individulas who are willing to make a commitment for a complete season to apply. It takes time and effort to teach these skills and the cost of providing housing and great organic meals requires some commitment and effort on your part to compensate us for our investment in you. Note that our CSA is temporarily suspended due to lack of consistent help. On Saturday mornings from the first weekend in May until the last weekend in October you can find us at the Rochester Downtown Farmer’s Market. If you shop in Northfield or the Twin Cities you might find our produce at Just Food Co-op, Seward Co-op, Hampden Park Co-op, or Eastside Co-op. You may also taste our produce at the Birchwood Cafe, Alma, The Creamery, Your Kichen Aid, very conscious, conscientious restaurants with great food in the Metro region. In the Southeast part of MN, you might check out Nosh in Lake City, Zest in Rochester, The Rainbow Cafe’ in Pine Island, as well as People’s Co-op, and some newly opened restaurants who have been shopping at the Rochester Downtown Farmers’ market. With aid from a S.A.R.E. grant, and a grant thru the state of Minnesota called the Experiment In Rural Cooperation, we were able to build an “off the grid” year-round greenhouse. We are working on other inovative projects as well with a goal of getting the whole farm “off the grid” and off of petroleum. It is an ambitious goal and if we have another generation or two left on this good ole earth…we will get there. (we may have to get rid of this computer tho…) If you would like to see some nice videos and slides of the farm and greenhouse project, check out S.A.R.E.’s website and look for year-round off-the -grid greenhouse, or go to http://www.cookingupastory.com/sustainable-food-earthen-path-organic-farm-video. Earthen Path Organic Farm will always be dedicated to taking care of it’s customers’ needs by combining industriousness and creative adaptability with over 40 years of experience in innovative and earth friendly growing methods. Connect with us to the great drama that goes beyond the mere eating of food for nutrients, for as the farm goes through it’s seasonal dance with the forces of nature, weathering the storms and adverse times, flourishing in the interludes, the promises of seed planted and tended end up on your table. You can follow the drama from Spring planting and the early greens and herbs, to late Fall freeze-up. Participate in an evolutionary structure that has arisen out of the need to recreate connection to the land, to it’s laborers, and to the communities on it, that are threatened by the industrial model. Our earth conscience has led us to go beyond merely organic in its present limited definition, to raising questions about technology, energy and resource use and how it all relates to our community and local economy. For this reason, you will see us using draft horses in the field, avoiding large fossil fuel dependant machinery, doing extensive cover cropping, using wind and solar technology, and working for the benefit of our rural communities. All of this you purchase in the price of some very tasty, nutritious fruit, veggies, eggs and poultry. The Full Circle Organic Growers Co-operative was organized in 1985. “Back to the land” organic fruit and vegetable growers, and the “never left the land” growers who banded together to help each other. We were one of the first registered organic vegetable growers’ cooperatives in the country but now market together informally. There have been many battles in organics over the years regarding standards and certification. Earthen Path has been committed from the start to sustainability, appropriate technology, family farms, and economic justice, even when mainstream organics and certification headed toward an industrial approach that disenfranchised many of the truly principled early leaders in the organic movement. We have not adopted the “corporate model” but have instead maintained our relationships with family, community, our land, and the co-operative movement. It is inspiring to have children, and former interns on their own farms doing a increasingly better job at caring for the land and making significant contributions to a sustainable food system and a healthier planet. What does it mean to go beyond organic? Organic tells you that your food is grown without synthetic ingredients in production or processing. Our sister farms, Earthen Path, Heartbeet Farm, Easy Yoke Farm, and the Yoder Families, strive to follow a more complete vision including appropriate technology and renewable energy as part versus sustainable farming methods, such as human, horse, solar and wind power, rather than industrial practices to grow your food. It means thinking in working ecologically appropriate scales so that there is soil is enhanced rather than depleted each season, and healthy social structures and rural community are preserved. It means we know and care for each other as well as our product. In essence, ” beyond organic” means committent to quality of life because we realize that the human race is simply one part of a full circle. Steven is proud of his “kids” and what they are doing on their own farms now…but weary of doing this farm solo as he has since 2011…looking for a partner to help keep this place going, or an arrangement that will lead to leasing or transferring the farm to a younger farmer or family of homesteaders.